﻿Toward the end of the Spring Semester, students and campus ministry staff at the Wesley Foundation at Iowa State University began planning some big changes for the upcoming Fall 2015 semester. A primary change is the addition of a new worship experience, tentatively called "Nucleus". While plans aren't yet finalized, Nucleus will be very different from the other worship experiences currently a part of the ministries at Collegiate United Methodist Church and Wesley Foundation. Nucleus will, most likely, happen on Thursday nights. The location will shift...sometimes outdoors (ISU's central campus or the patio in front of Collegiate), sometimes indoors on campus or in Collegiate/Wesley's buildings. Moving worship around will increase the likelihood of ISU students "stumbling across" this exciting, new worship experience and the non-traditional settings will be designed to be more inviting to unchurched and minimally churched folks. We ask your prayers as we continue to shape this new worship experience so, along with all our other Wesley Foundation activities, it might help many students begin and strengthen their relationship with God and discern God's will for their lives. I periodically ask graduating Iowa State students to write a little something about themselves, their experiences at ISU and the Wesley Foundation and what's next for them. This year I was slow to do so but, no matter! I received this wonderful, UNSOLICITED email just the other day from one of our graduating grad students. I'll share OTHER student responses next month. I wanted to say thank you to you and the congregation for opening up your community of faith to me. Today was my last Sunday worshiping with Collegiate/Wesley. I will be graduating on Friday and moving back up to Minnesota, where I am from. I was only a part of the church since August, but I am so thankful for the being a part of an amazing congregation. My first couple weekends in Ames I tried out a couple of churches. One I went to was a Mega church. I felt so lost in the crowd. It seemed more like a rock concert for Jesus than a time of reflection and giving thanks. For me it was not a good fit, but luckily I decided to attend a service at Collegiate/Wesley. I felt a sense of closeness and common beliefs with this church. I was reminded of my hometown church and being here on Sundays took away some of my homesickness. I was blessed to meet so many kind people and grow a little deeper in my faith. Thank you for allowing me to volunteer with the Emergency Residence Program children. I had a great time getting to know those kids. My only regret is not being able to volunteer more. Being a graduate student made that a little difficult. Finally, thank you for all the prayers. I am excited to hear back from the University of Minnesota Dental School on if I got accepted into the Dental Therapy program. The prayers of the church have been so helpful. As mentioned last month, folks from the Wesley Foundations at Iowa State the University of Iowa joined others on an Alternative Spring Break at the Heifer Project Ranch in Perryville, Arkansas. Here are comments from a couple of them, with more to come NEXT month. 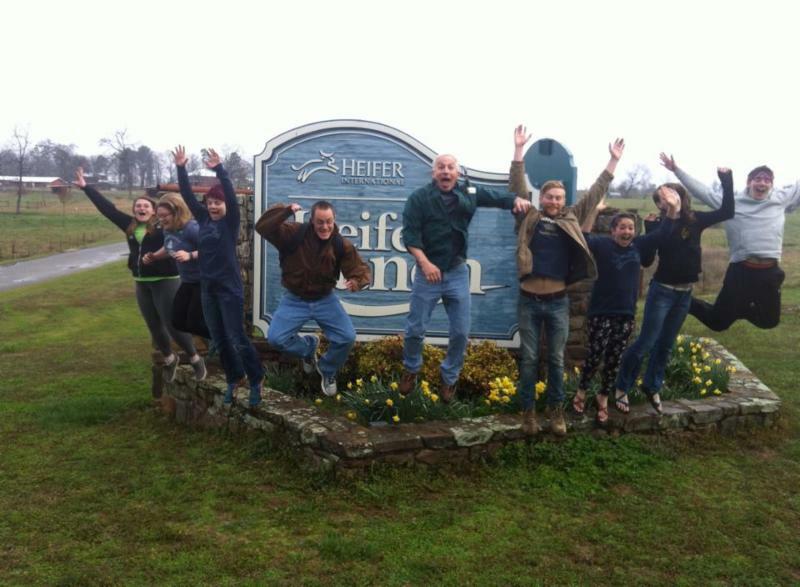 The Spring Break trip to Heifer Ranch in Perryville, Arkansas was refreshing and motivating. We had the opportunity to do service work for the maintenance, livestock, and garden crews at the ranch. In addition, we did many team-building activities within our group and with the other college groups from Emporia State, Samford and McPherson College, all culminating in a poverty simulation where we stayed in "Thailand". Maybe most importantly, we learned about Heifer's work and used their model to create a project to bring back for the betterment of our home communities. Our project is to collaborate with the other three Wesley Centers in Iowa to create a video highlighting the importance of the Wesley Foundation through personal stories. Hopefully this video will be seen by churches all across the state to increase awareness of our ministries. A hard copy of the finalized project will be sent to the Annual Conference leadership to give them insight in their decision making. We are currently looking for a project leader for Iowa State's section of the team! This got really serious sounding, but I want you all to know that service trips are an essential part of our ministry! They are invigorating and strengthen a sense of community in unimaginable ways. Heifer Ranch provided space to look at places where I could make change in my own life. It encouraged individual, as well as communal responses to the injustices we see in our everyday lives. I also appreciated being able to serve at the ranch. My favorite day was helping out in the garden. Overall, it was a life-giving week for me. These wonderful young people make up the ISU Wesley Foundation group spending their Spring Break trip on a service-learning trip at the Heifer Project Ranch in Perryville, Arkansas. They'll gain a much greater understanding of Heifer's mission around the world, participate in service projects with livestock, gardening and Ranch management, spend 24 hours in Heifer's Global Village and grow closer to themselves, one another and God. Watch this space next month for some personal testimonials! You're receiving this email because you have expressed an interest in Collegiate United Methodist Church/Wesley Foundation. Please add mail@cwames.org to your address book so we'll be sure to land in your inbox! The Simon Estes CD's are available and can be purchased in the office for $15.00. You can access the latest Communicator here. Choir Mass Special - 8:30 a.m. & 11:00 a.m.
Collegiate United Methodist Church/Wesley Foundation's Chancel Choir will present Mozart's ("Sparrow") Mass KV 220 at the 8:30 and 11:00 a.m. services on Sunday, February 2. This mass will be part of the communion services scheduled for that day, and its movements (Kyrie Eleison, Gloris in Excelsis Deo, Cedo, Sanctus and Agnus Dei) will be sung at the appropriate times during the liturgy. This Mass is written for chorus and soloists, and is scored for an orchestra of strings, two trumpets, and timpani. Three selections from Mozart's "Solemn Vesper Service" will also be presented during the service. The chamber orchestra consists of members of the Des Moines Symphony, ISU faculty and students. All soloists are members of the C/W 45-voice Chancel Choir. The public is invited to attend this annual worship experience. There will be no Children's sermon this week, but we will still have Kids Korner at the 11:00 a.m. service. Join us for a time of fellowship after each worship service at 9:30 a.m. and 12:00 p.m. in the Gathering Space. We have Sunday school classes for all ages beginning at 9:45 a.m. Please see the weekly bulletin for a full class listing. Join us each Sunday evening during the school year for faithspring, our alternative worship experience at 5:30 p.m. in our Annex worship space at 130 S. Sheldon. It's a casual setting with tables and chairs, a live band, three big screens. FREE Sunday Supper follows at 6:30 p.m. Bring friends! There will be a table set up on the landing where you can purchase either a church cookbook or a church history book. They are both selling for $10 each. Also please check your recipes in the Souper Supper Cookbook and if there are any errors, please email Sherry or Dolores the corrections at sdavidson1974@yahoo.com or dolobro@gmail.com or drop them off at the church office. Thank you for helping make the cookbook a success. Souper Bowl of Caring is a movement that is transforming the time around the Super Bowl into a celebration of giving and serving. Come help support the high school mission trip and celebrate Valentine's Day with a special heart shaped meal of various breakfast foods - egg bakes, pancakes, biscuits and gravy! We will begin serving at 11:00 a.m. on February 9 in Wesley Hall. Is your spirit needing a quiet time, a time apart? The week-end of Friday, February 28 - Sunday, March 2 has been reserved for an All-Church Spirituality Retreat at Camp Quaker Heights near Eldora, Iowa (note location change). The goal of this retreat is to provide space for renewal and fellowship as we prepare for the Lenten Season. All are welcome and encouraged to attend. The cost will be $90 for two nights dorm-style lodging, 5 meals and a book. Double-room lodging is an option. Carpooling will be available. All interested in the retreat, please contact Bev Shirbroun, bnerv1@yahoo.com, (515)231-7530 or Cynthia Lidtke, lidtke@hotmail.com, (515)231-5969. Mark your calendar for the weekend of February 28-Sunday, March 2. Please make your reservation by Sunday, February 9. If you would like more details about our trip click here. The trip will be from August 2-10, and the deadline to "get your spot" is February 14. At that time there will also be a $100 non-refundable deposit due. If you have any questions please contact Mike King at 292-3831, pjking@netins.net or Sydney DeGeest at Sydney.degeest@gmail.com, 292-3161 . Multi-vitamins for the Philippines Maureen Wilt and Bev Kruempel are collecting mult i-vitamins to take to the Philippines on a Volunteer in Mission trip in March. Multi-vitamins for children and women are especially needed. You can give them directly to Maureen or Bev or leave them in a specially marked basket in the church office. Thanks! The music program at CUMC/WF has agreed to host the Morningside College Choir when they come to Ames to perform. This involves providing a potluck dinner to share with the choir before their concert on the evening of Thursday, March 6, and housing 40 students that night in local homes. If you are able to help with this effort, please contact Jane Kennedy (jbkenn@yahoo.com or (515) 231-1189) and indicate how many students you would be willing to accommodate for the night, what kind of arrangement, and if you have a preference as to whether you host boys or girls. In addition, please indicate whether you would be willing to participate in the potluck dinner prior to the concert. Thank you for your willingness to help! Let your members know about the latest news for the ministry. Highlight your mission statement and the goals of the ministry. Drive traffic to your website by entering teaser text for the article with a link to your website for readers to view the full text. Describe the ministry's event. Let members know the volunteer opportunities available for the event, and who to contact if they want to help.